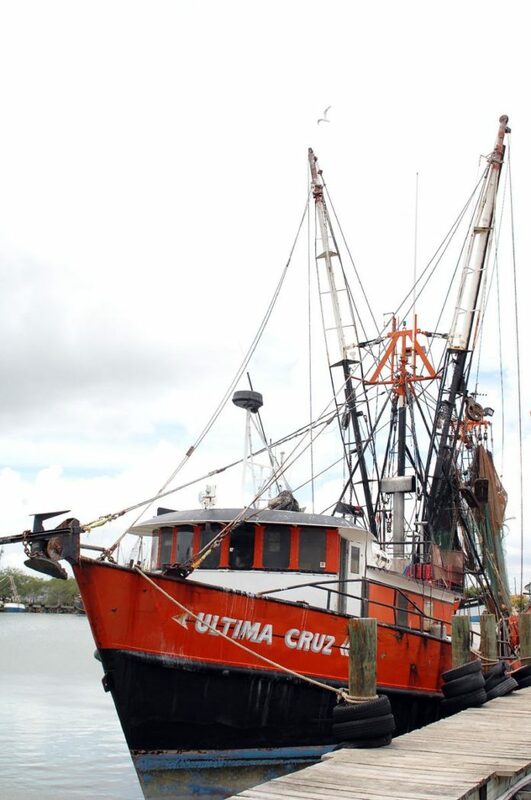 Ultima Cruz shrimp boat is shown docked at the Brownsville Shrimp Basin Thursday, Aug. 24, 2017, as Hurricane Harvey approaches the Texas coast. The gulf shrimp industry is happy about a new monitoring provision inside a pending federal budget bill. The $5.7 billion dollar U.S. industry built on the importation of foreign shrimp is not happy about a monitoring provision tucked away inside a pending federal budget bill, though the Gulf shrimp industry is all for it. Jan. 1, 2018, was the compliance deadline for 10 other species under SIMP, though shrimp and abalone were to be phased in later. The provision in S.B. 1662, if it takes effect, would give the U.S. import shrimp industry 30 days to prepare for the new reporting requirements. Imports represent 90 percent of the U.S. shrimp industry. “Importers of record,” typically U.S.-based seafood dealers, would be required to maintain records for at least two years on the type of species caught, when and where the species were harvested, quantity and weight of the harvest, type of gear used, name and flag of the fishing vessel, first point of landing and other data. Lobbyists for U.S. shrimp importers and brokers complain that the haste to comply with the new regulations could create major obstacles to shrimp imports and, as a result, put a hurt on retailers that depend on imported shrimp. The Gulf shrimp industry, which has long struggled against the tide of cheap foreign shrimp, doesn’t see it that way. A spokesman for the Southern Shrimp Alliance noted that shrimp caught in U.S. waters has to be tracked via “traceability tickets” and said there’s no reason imported shrimp shouldn’t also be subject to reporting requirements. Andrea Hance, executive director of the Texas Shrimp Association, said her side is pushing to make sure the monitoring provision stays in S.B. 1662, though she admits Gulf shrimpers’ lobbying power is tiny compared to that of the import industry and restaurant lobbyists, which want to maintain the ability to import unregulated foreign shrimp.